Do you ever notice how some women always seem to have it together? They’re calm, perfectly groomed at the school gates, calm and happy with both feet firmly planted on the ground, even amidst turmoil and children screaming. They stand tall with their shoulders back and stand strong to weather the many storms that come their way. They always see the positive and uncover blessings like the beautiful hidden gems that they are. Magic seems to find them each day, inviting an authentic smile to cross their lips. And all you feel next to them is that YOU’RE over anxious, over stressed and overwhelmed. We all know a woman like that, that seems to have it all sorted right? Others, not so much. When similar turmoil is thrown their way, they tend to experience more difficulty dealing with life’s curve balls that takes the stress levels sky high. The silver lining is difficult for them to see in the haze as they struggle to find their joy and feel stuck in their situation. It’s easy to say “Look on the bright side,” or “Keep a positive mindset,” so that everyone can be a part of the happy-go-lucky group. But sometimes in the throes of life we forget just how powerful we are in creating our own destiny and we give in to stress and anxiety. So, to share the real calm steps and bring this to life I wanted to share a story of one of my AMAZING VIP clients. We’ll call her Kat. She’s very senior in the banking world and achieved a huge amount, YET she always felt like she never did enough and that she was going to be found out so a big old dose of imposter syndrome. With ALL these old stories and beliefs, she was constantly stressed and worried. So, when anything in her life happened her whole life would come to a halt and she’d have what she used to call a meltdown. She hid away and not be able to think, make decisions and accept what had happened. Through A VIP day AND our weekly Breakthrough calls, we created a really strong self-identity so she had more confidence and self-belief. 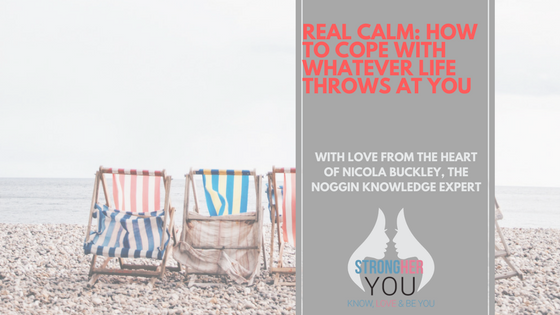 We also created a tool box of Noggin Knowledge hacks and tips to keep her focus on herself and reduce her anxiety. We created her version of REAL CALM. And this was tested when she ended up in hospital recently, she kept her calm through it all and meant her recovery was so much quicker. She let go of what she couldn’t control and instead putting her energy and focus into recovering. What’s REALLY going on when you lose your Real Calm? So here we go with the Noggin Knowledge. When you lose that Real Calm, there’ll be an area of your life where you don’t have prediction and response. The brain is a pattern seeking machine, so where there is a break in the pattern and the norm … the brain goes back into survival mode. Reacting NOT responding, you’ll essentially have a short fuse. Our BIG ideas only come when we’re in Real Calm mode. Feel tense and on edge, that’ll sap your energy. Not thinking or feeling, not being YOU. And what is truly happening here, you’re shifting from the sympathetic nervous system so the rest and digest … so the Real Calm into the para sympathetic nervous system so the fight and flight, our primal survival system. The more time we spend here, the less time we’re thinking and developing so the more and more stressed we become. PLUS add to that, that it releases huge increases in cortisol which when prolonged has some really negative effects on our energy and health. And effects our digestive system, so we don’t break down our food in the most efficient way, which will affect your weight over time. Plus our bodies will be in a constant state of stress, so inflammation is higher, increasing any pain or conditions that are already there. The challenge about stress and having that ability to be Real Calm is that it’s an absolutely necessary emotion. Our brains are wired such that it’s difficult to take action until we feel at least some level of this emotional state. In fact, performance peaks under the heightened activation that comes with moderate levels of stress. As long as the stress isn’t prolonged, it’s harmless. YET for most women I speak to, really all of their stress is self-created. This is not a judgment but they are NOT in physical danger, emotional pain YES which lights up the same pathways in the brain but physical pain NO. Which means it we’ve created it, we can also change it … it’s all within our gift. While I’ve run across numerous effective strategies that smart people employ when faced with stress, what follows are ten of the best. Some of these strategies may seem obvious, but the real challenge lies in recognising when you need to use them and having the wherewithal to actually do so in spite of your stress. The first thing we do as we come into the world and the last thing we do as we leave. So if life feeling a little fast and too much, if the kids are screaming or you’re about to going into a scary meeting at work. One of my clients Kat is the MD of a banking company. She’s an amazing leader and brilliant at what she does. Yet some days she can still get scared and worried, feeling the pressure and doubting herself. So before big meetings she’ll just breath for a few minutes and left the stress go and confidence flow back, her mantra “just breath” gives her perspective back. Before she’d get super stressed and worried, not feeling like she was making her point in meetings. Now she gets what she wants and keeps control. And from a Noggin Knowledge point of view this is bringing us back to rest and digest so our sympathetic nervous system … Which is where we relax, eat and we can be truly ourselves. We can see asking for help as weak, society has led up to believe that we need to be a superwoman keeping all plates in the air on our own without a hair in place. That to me is a lie, I believe it is strong to see when you need some help and support. It’s NOT the asking for help that’s the problem it’s your attachment to what that means. When you think of the BIG achievements of our time, no one person does those alone … they have a team and same for you. Why stay stuck when you can ask for a little help and support? So for right now, ask yourself … what would help me most right now? Who can help me with that? What could I help them with in return at some point? Or if you don’t feel you want to ask for help, share it with yourself to see how you feel. So write it all down, mental vomit about what’s going on for you right now. The process of writing it down helps us to understand and see the truth of what’s happening. You’ll be processing it and shining the light on what’s the story behind your reaction. It’s giving the subconscious air and will make it feel lighter for you. When life throws curve balls at us, we can go into mend and fix it mode. We’re all too willing to martyr ourselves and give up on all our feel good foundations. Good food, moving, love bombs, you time, morning magic and date nights all go out the window all life gets in the way. YET these are the very things that were the basis of you feeling good. So keeping these when life hits hard will help you deal with what’s happening and approach it in a feel good way. You own that to yourself and to relieve some of the stress, you’ll approach it as the best of you. Time travel is a key concept within the StrongHer Noggin Knowledge, it’s life changing to think of where you are in your own mind. Time travel is when you think about the past or the future, rather than loving in the past. The past is DONE, all we can do now is change our view of it. The future is NOT yet here, so all we can do is live our best life now. ^^^ When we get hit by life we tend to time travel into the future and go into the what if’s … what is this happens, then this, then this. And many women are on what I call scenario 39 before they even realise. When life hits hard it’s easy to be in the future imagining the worse yet in doing that we give our power over to a future we’re not yet it. Our true power is to influence that by doing what we can NOW to create what we want. There will always be something to be grateful even in the darkest of times, gratitude and fear can’t exist together so the more gratitude you feel the less you’ll feel fear. In every single thing we go through, no matter how hard it is there are lessons to learn and see about ourselves. It’s hard at the time, but a simple way to make peace with what’s happening for you. So think about a curve ball that life has thrown at you that was really hard, write down what it was and how you felt. Then think about the lessons from it, the negative as we’re wired that way that’ll be easy. Then the positive lessons from it, as hard as they might be to see there will ALWAYS be something there. AND the even more powerful part of this, is that you’ll accept this curve ball and embrace it as part of your story rather than feeling shame, embarrassment or being hard on yourself. 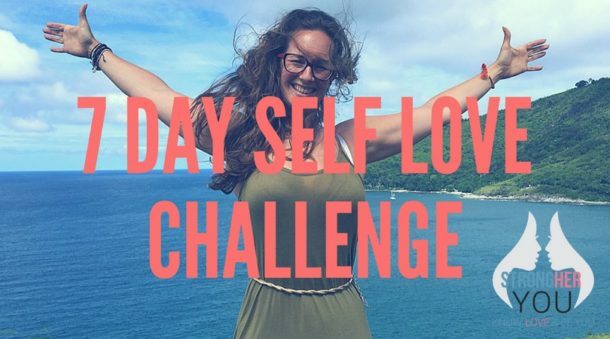 Life will never stop happening to us, we can chose that it happens for us and if you follow these steps you will start to feel that powerful shift.